In the years since I started at NASA Goddard as a summer intern, I have put my astrophysics degree to work communicating about NASA missions both big (the giant infrared James Webb Space Telescope) and small (the Rossi X-ray Timing Explorer). I have: written extensively about astrophysics; podcasted and blogged; created educational games; developed websites; mentored interns; talked to VIPs and tour groups, run social media accounts and events - all to help bring NASA science to the public and to educators. 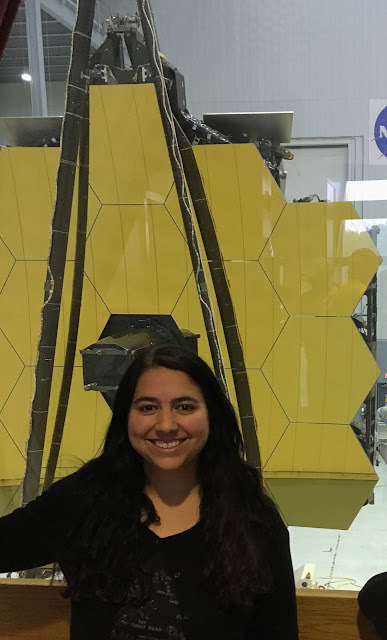 Currently I'm the social media lead and website manager for the James Webb Space Telescope, which I love talking about because it’s awesome, and not just because it’s part of my job! Outside of work, I write science fiction short stories, plays guitar and sing in a local band, and am working on my fluency in Norwegian. You can find me on twitter as @maggiemasetti.